We stock Leader (Canarm) propeller fans in our warehouse! The AX series exhaust fan is a sturdily constructed, direct drive, horizontal discharge fan that is typically use for general ventilation of factories, garages, warehouses and other industrial or commercial buildings. 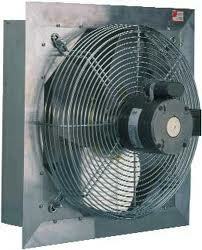 The AX fans are available in multiple single-speed variations as well as two-speed and variable speed models. The AX series housings are constructed of heavy duty aluminum with built in shutters that automatically open when the fan starts and gravity closes when the fan stops.